When we first met Pat as a joey, we weren’t sure if she was female or male. Pat suits both, and it sounded good with her mother’s name: Smoky. Pat has been known to our researchers since January 2006. She was still a baby living with her mother Smoky. She would have been born in early 2005. We have no idea who Pat’s father was – but an older male, Calvin, was present in the area and looked like a dominant male. Pat’s mother, Smoky appeared in this National Geographic video at around that time. 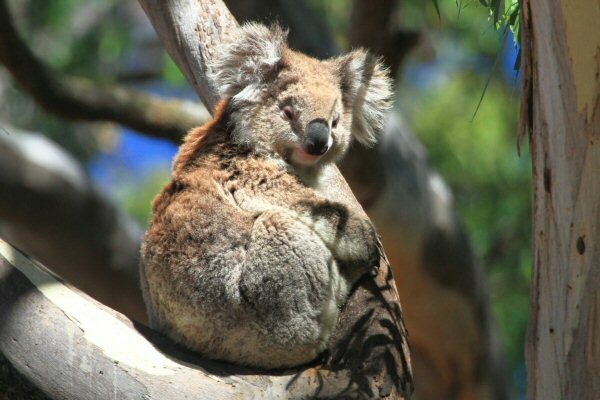 Pat is one of our most frequently-seen koalas. In 2016 she was seen on 165 days. In 2017 she was seen 156 times. Pat’s mother Smoky shared a home range with her until her death in 2012. Pat has raised three sons – Pitta in 2008 (father probably Merle), Clancy in 2010 and Banjo in 2012 (fathers of both probably Anzac). Clancy remains part of our research project. Pitta and Banjo have left the area and not been seen recently. Through Clancy, Pat has two known grandsons – Wurdi and Bunyip born to Ngardang in 2016 and 2018, and one known granddaughter – LuLu born to KiKi in 2018. Hopefully Pitta and Banjo also have offspring. Pat’s home overlapped for many years with Anzac, the dominant male of the region. He was also probably the father of Clancy and Banjo. Now that he is gone, she has three males sharing her home range: Lluvia, Cruiz & Zack have split Anzac’s range between them. Her nearest female neighbours are Misty and Cuddles, Ruth, Shaz and YuYu. Pat did an amazing thing in 2013 – she left her home range to visit her adult son, Clancy. Read about that here. Pat has survived the following extreme heat waves and droughts. Millenium Drought 1996 – 2010: the worst drought in Australia’s history. Pat was born during this drought, which would have been a huge strain on her mother Smoky. Smoky never had another joey. 2009 Southeastern Australia Heat Wave: 27 January to 7 February (3 consecutive days over 42C, then a record high of 48C on 7/2/09). This heatwave led to the Black Saturday bushfires in other parts of Victoria. How do we have so much research data about Pat? Echidna Walkabout’s Wild Koala Research Project has been monitoring the koalas of the You Yangs and Brisbane Ranges for 21 years. In 1998 we discovered a non-intrusive method of identifying koalas by their natural nose markings (nose patterns). Since then we have been collecting koala research data during tours, and using it to advocate for koalas, plant trees where they are most needed, and remove weeds to improve koala habitat. Koala Researchers employed by Echidna Walkabout are paid to find koalas and collect information +/- 310 days every year. All our tour guests play an important part in this research, by making it possible through funding, and by looking out for koalas on our tours.